2. 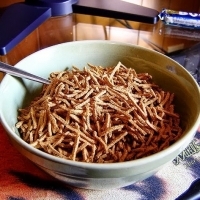 In a large bowl combine bran cereal and milk. 3. Add remaining ingredients and mix gently. 4. Spoon mixture into muffin tins that have been well sprayed with vegetable oil.